Cast: Peter Sallis, Helena Bonham-Carter, Ralph Fiennes, Peter Kay, Nicholas Smith, Liz Smith, John Thomson, Mark Gatiss. Directed by Nick Park and Steve Box. Story: Clay team Wallace and Gromit chase a big bad bunny. Wallace and Gromit in The Curse of the Were-Rabbit is everything you'd hope and expect from Aardman. Hugely entertaining and marvellously funny, it easily holds its own against the standard animated fare. 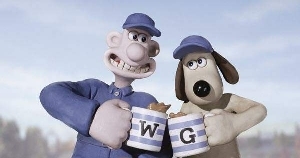 We're all familiar with Wallace and Gromit - they're a British institution. Wallace, voiced by Peter Salliss from Last of the Summer Wine, with his Heath Robinson contraptions and fanatical love of cheese. Gromit, with his silent expressions and loyal devotion to his often dappy master. On the big screen, they lose none of their appeal as they go about their new business of humanely capturing rabbits who are eating the local residents' veg. The rabbits are completely brilliant, being unbearably cute and hysterically funny at the same time, while not having any dialogue bar the odd squeak. 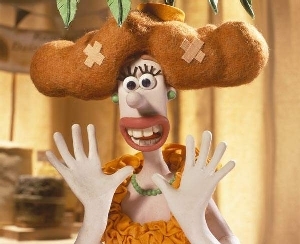 Nick Park's Aardman team are highly skilled at conveying a great deal with the smallest expression change and they use that talent to exceptional effect throughout the whole movie. Five years in the making, apparently. They used the time well! Regular voicer Peter Sallis is joined by big names Ralph Fiennes and Helena Bonham-Carter who are both top notch in their posh guises, with amusing support from comedian Peter Kay as the local bobby. The usual jolly soundtrack and myriad of humorous details will tickle even the most miserable of bastards, old and young alike, in the most inoffensive way possible. This, like Madagascar, is a movie that will be enjoyed time and again by both parents and children, and I can't see it becoming tired even after ten or twelve viewings - much like the fantastic Creature Comforts TV series and, for that matter, pretty much everything that comes out of Aardman's studio. The fact that it's a very English style and still made the US number one spot speaks volumes for the quality of this movie. The Curse of the Were-Rabbit is a magnificent achievement - funny, entertaining, cute and massively pleasant, it's a film for literally everyone. Go and see it, it's as simple as that. Wallace and Gromit in The Curse of the Were-Rabbit is on general release in the UK now. Back to the film and you can see why it took so long to make. I was expecting an extended TV episode but boy was I wrong. We have a story, we have a plot, we have heros and villians and we have fantastic animation and best of all it's British!! ... look out the box near the end of the movie and the sticker "May Contain Nuts" it works on so many levels. Have a day at the flicks see this and Sky High and you'll have a smile on your face for a couple of days and the odd chuckle as you re-view some scenes in your head.